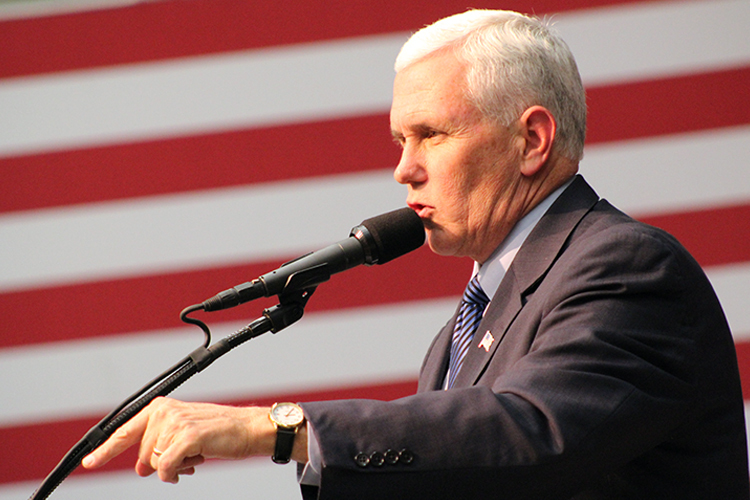 In a last-minute effort to turn Northern Virginia red, Indiana Governor and Republican vice presidential candidate Mike Pence gave a unifying speech to hundreds of supporters gathered in the Hub Ballroom on Mason’s Fairfax campus this past Saturday. 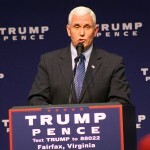 After several introductory speakers and inspirational songs on repeat (lyrics included “it’s gonna be a long, long time,” “I was born free,” “unknown stranger,” and “you can’t always get what you want”), Mike Pence appeared on stage with his wife and daughter, Karen and Charlotte Pence. 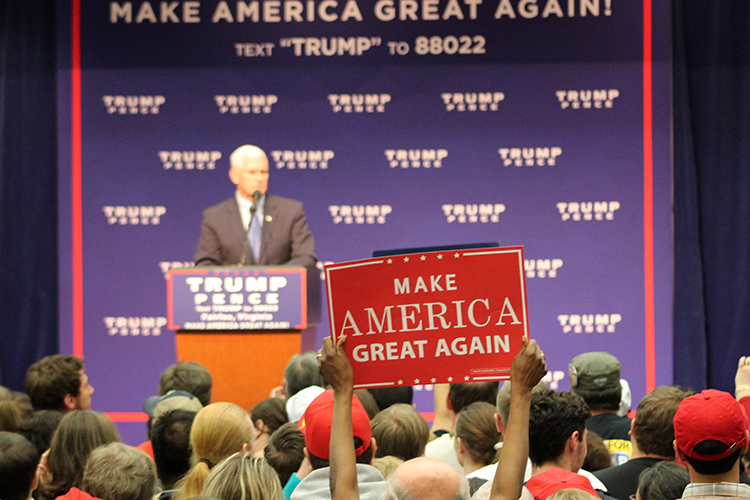 “I am a Christian conservative and a Republican,” he began. 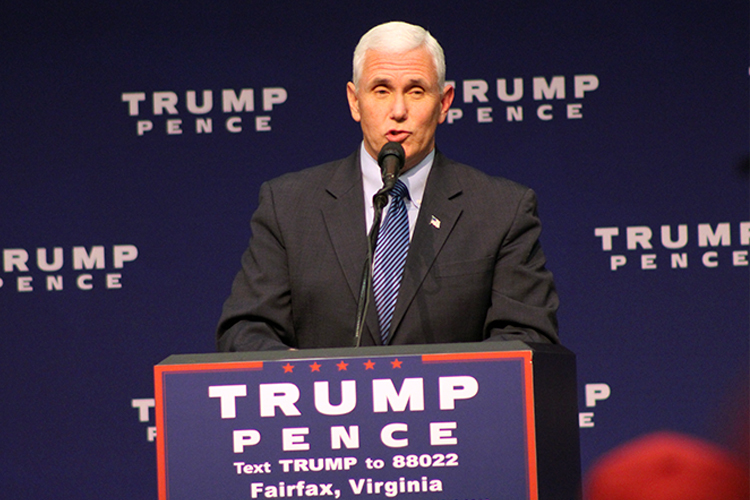 Mike Pence addresses supporters on November 5, 2016. 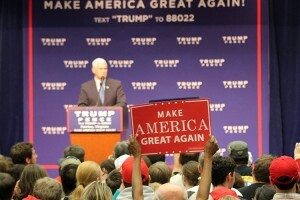 Pence spoke for about an hour to a cheerful and reactive audience, tackling the main points of Donald Trump’s platform – security, jobs, immigration and the Supreme Court. The pro-life agenda, free markets, lower taxes, and religious values were just a few of the issues highlighted by the governor. That being said, the beginning of the speech – and more than a third of it – was dedicated to Hillary Clinton’s failures and lack of accountability. “No one is above the law,” he said, as the crowed shouted, “lock her up!” “Let’s not forget what we already know,” he went on, listing his campaign’s accusations against Clinton and pointing out her alleged conflicts of interests. “Shame on her,” the crowd responded. 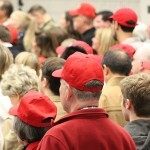 After the event, supporters were more than satisfied. “It was wonderful, solid, grounded… It was great! 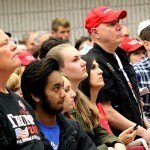 He gets better and better,” said Beth Baron, a strong Trump supporter. Pence’s appearance drew a group of protestors holding signs reading “My Body, My Choice,” “Build Bridges, Not Walls,” and the now-famous Clinton refrain, “Love Trumps Hate” outside The Hub. 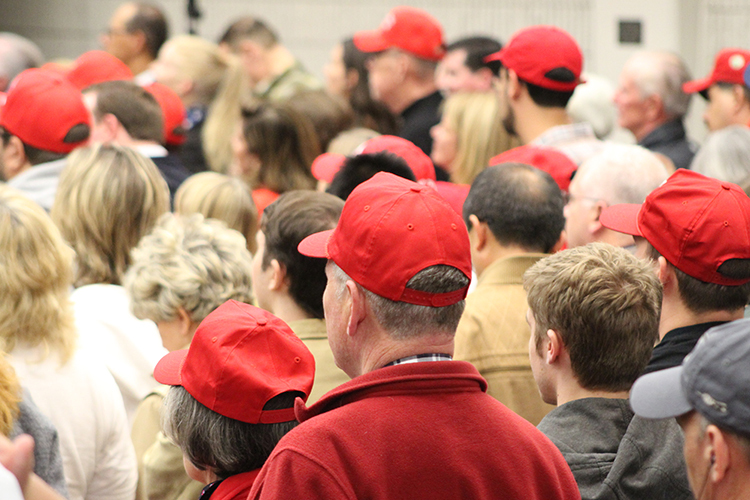 Two hours before the event was scheduled to start, protestors led by the Mason Democrats gathered near the entrance of the venue amid a sea of Trump/Pence supporters sporting the famous red “Make America Great Again” hats frequently worn by their candidate. 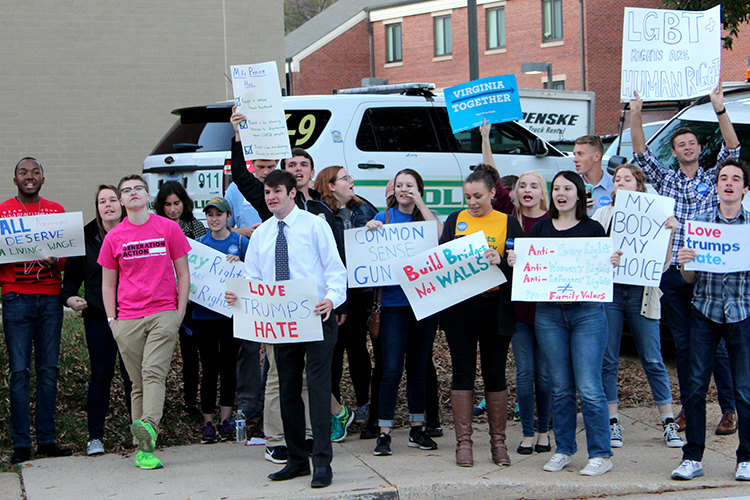 Their protest lasted throughout the rally and could be heard sporadically from inside the event. A Trump supporter’s button suggests Hillary Clinton should be imprisoned. Susan Merdler traveled to Mason from Fredericksburg to see Mike Pence speak after attending two of Trump’s previous rallies. 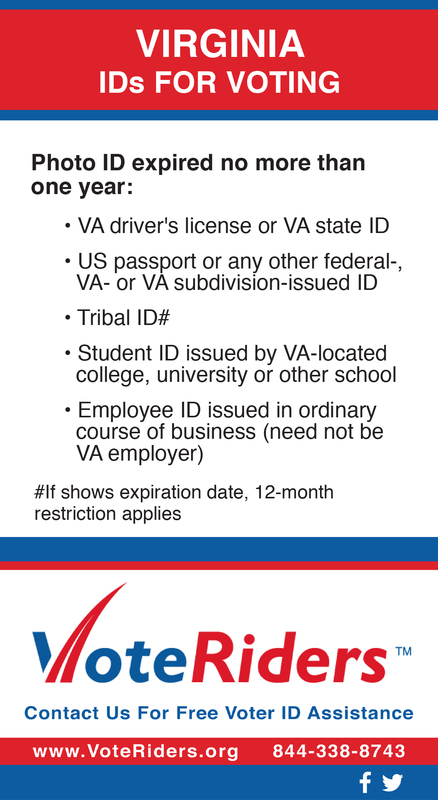 As a veteran, national security is the main reason why she is supporting the Republican nominee. “I can’t stand that Hillary Clinton lied under oath. Trump never did that,” she said. Lying under oath seemed to be a concern for a great number of Trump supporters we spoke with and Pence mentioned it during his speech. 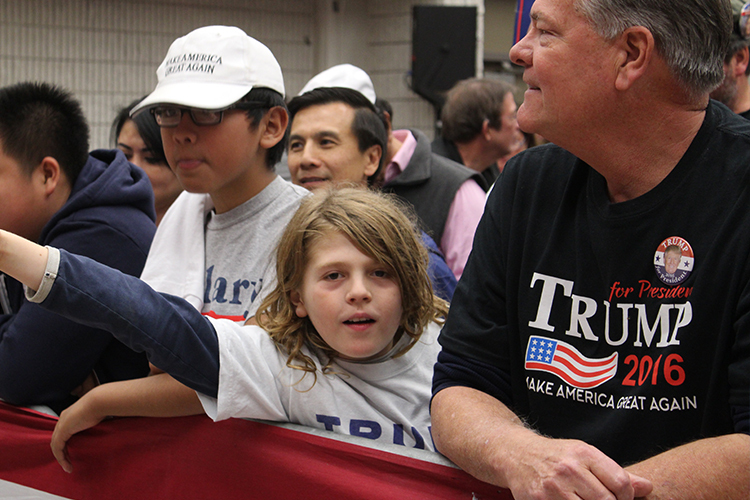 “I have a master degree and I support Trump thousand percent. I hope that students attend and that minds can be changed tonight,” she concluded enthusiastically. 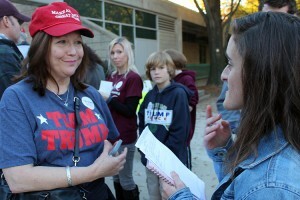 Mason Votes reporter Victoria David interviews a Trump supporter outside The Hub. Alec Vaca came with his parents to the rally. After having watched past Trump events on YouTube, it was an opportunity for him to finally attend a live event. 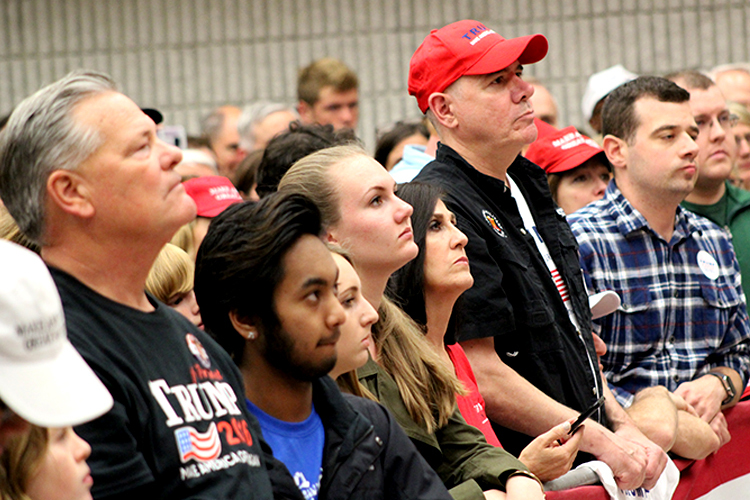 “We have been supporting Donald Trump since the beginning. We need to protect our borders and Christian values,” they told us. However, they were not members of the Republican Party, they insisted, a party they thought had done “bad things as well.” Alec’s parents are Bolivians, they have been in the US for 25 years now. Trump’s position on immigration is more a solution than a problem for them. “We have to try. We have to at least do something. 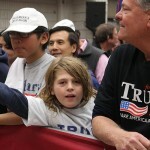 Illegal immigrants are going to go back to their country and they’ll eventually come back,” said Alec’s mother Carminia. For Dr. El Tinay the speech was “successful, uplifting, well-organized and substantive.” As a former leader of the May 68 (a French anti-establishment leftist movement), international relations teacher, and supporter of Barrack Obama, he demonstrates the far-reaching appeal of Donald Trump’s platform and the Republicans’ best hope for winning on Tuesday: crossover support from the Democratic party.